I suspected that it was only a matter of time before some slug stole (yet again, it's happened before!) my copyrighted work here on Scott's Web Log since that's been rampant in the last few weeks. Sure enough, one of my d-friends, in this case Ronald Gregory who writes "The Poor Diabetic" (on Twitter, his handle is @thepoordiabetic) sent me a message via Twitter that my blog had been plagiarized by someone ambitious enough to lift my content, but too lazy to give proper attribution to me as the copyright owner, in spite of my copyright notice which is quite clear that attribution is required (see the right margin of my blog under the heading of "Content Rights" for more detail). Let's just say the user of my content never bothered to contact me and ask for permission to use my content! I am merely the latest diabetes blogger to have had my blog content stolen without attribution. Kelly Kunik at Diabetesaliciousness(TM), for example, recently wrote a post entitled "Diabetes Blog Plagiarism Is Rising Faster Than My Blood Sugar After A Six Course Pasta Dinner!! ", as have several other diabetes bloggers. However, I have dealt with this issue quite effectively in the past, so I was very well prepared this time around! 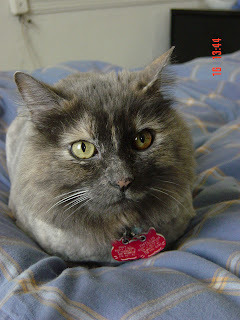 Back on April 25, 2007, I wrote a post entitled "Copyright and My Cat". Experience taught me how to deal with copyright invasions very effectively. But I figured it might be worth repeating the contents from that post here, as well as the correspondence (redacted with my personal information removed, naturally) to the offending domain registrar and host. For my fellow d-bloggers dealing with this issue, I hope this helps you deal with these creeps! I used the basic template outlined in the sample letter noted above. But after identifying both the domain registrar and host as GoDaddy.com, I made a quick telephone call to their customer service department and asked what e-mail address I should send my DCMA Copyright Complaint to, and was told to send it to: copyrightclaims@godaddy.com, just be sure to send this correspondence to the right domain registrar and host! I, C. Scott Strumello, owner and publisher of "Scott's Web Log" (http://blog.sstrumello.com/) certify under penalty of perjury, that I am the only agent authorized to act on behalf of the owner of certain intellectual property rights. I have a good faith belief that several items or materials listed are not authorized by law for use by the above named domain name owner or their agents and therefore infringes the copyright owner's rights. I hereby demand that you act expeditiously to remove or disable access to the material or items claimed to be infringing. Under the Digital Millennium Copyright Act (DMCA) of 1998, my I am able to file a detailed complaint for review by you as the both the web host and registrar. This is a very helpful post for anyone whose blog is being scraped. And, for the record, I love Phyllis. Your cat has sass to spare! I am having the same problem, though some of the time I am unable to find contact information for any party involved. What really torques me is that most of them appear to be run in order to host Google Ads. When I have identified them to Google, their only response is to send me a form letter telling me to file a DMCA complaint with the site owner. Google knows it is profiting from ads placed on pirate sites and doesn't care. If Google would check out the sites it put ads on more carefully, there would be much less incentive for people to steal content. It is just so infuriating when this happens and worse still is the fact that our hard work can be twisted to fit their agenda and destroying ones reputation without their knowledge, In Kelly's case they went as far as claiming she was a member and a contributor. To me my reputation both online and off line is equally valuable and the idea of it being smeared just brings me out with guns a blazing. Kelly had an Idea of contacting the site advertisers as well as they could be held liable. In this case Amazon and godaddy, we have to hit them where it hurts the most. Scott: Great post (though it's sad we have to write about these things at all...). Very helpful and informative. Kelly and I wrote about the same issue the same day just by happenstance, as both ours' were being plagiarized. She worked to get that site taken down quickly, and my efforts too have since paid off and that lifting site is down. These things are happening frequently, and it's important to keep the focus on them and let everyone know how to be aware and deal if need be. So, thanks! And Phyllis rocks! Looking at the blurb / first para on the master site http://questions.freediabetescure.info/ it looks like it's been through two automatic translation processes: from English into another language (can't figure out which, yet) and back into English. Which suggests that diabetescure.info is probably getting their feeds from another source, which source would be the true/original culprit in this matter (especially if the site or site owner is located in a country which does not respect DMCA and can then represent its content as freely-available to anyone who wishes to lift it). Everything that you listed is accurate except the fact about what you would do if they just said, thanks, but no thanks - I'm not taking it down. Then you have to get your lawyers to write up letters and file with the courts, which gets very, very expensive. If they take it down, then all's good. Scott, did your letter get a response from anyone? I think it should be possible to get these kind of scummy sites taken down. Do you think writing to Google would be useful? Clearly Google advertising is enabling these places to exist. Thanks to my fellow bloggers for for letting me know! As Brenda notes, it does appear that my posts are being lifted after being translated into another language by machine, and then translated back into English using Google translate or Babelfish, which explains the various typos in the plagiarizer's website. Google was useless when it came to my complaint, and I think Jenny was right in that the company is more interested in advertising dollars than in doing the right thing about plagiarism. I have sent formal complaints to the site's host and domain registrar, but it takes some time for them to investigate and respond formally, to Answer Bernard's question: I am still waiting for a formal response from GoDaddy.com. But I would encourage everyone to send your complaints and also include a hard copy mailed to them by snail-mail (the postal service) with return receipt requested so you have a legal document verifying your complaint was received. My guess is this site won't be around for very long, but until it's gone, keep the complaints to the host & domain registrar coming! As I was writing my last comment/response, I received an e-mail from GoDaddy.com that indicates "We have suspended the site in question pending a resolution of this matter." But that doesn't mean the case is closed. notification by us unless we receive official notice that you have initiated court proceedings. If we do receive such official notice, the website will remain down according to the directions of the court(s) at that time." I don't make money writing this stuff, but I will try and defend myself to the extent possible without a costly legal team. Hopefully, the plagiarizers will conclude that its just not worth stealing my content and will remove it accordingly, but they could be jerks about it. Only time will tell!! thank you so much for this post! my blog, website, and now upcoming event is being copied from some anonymous person until I found this post which gave me the necessary tools needed to find out who this creep is that keeps harassing me. I agree. Plagiarizing can be really annoying especially when you have put so much hard work in to it. In this technological age it's happen very often. This leads to the original website owner losing page rankings, traffic and revenue. Theft of website content is a rapidly growing problem and owners should check their content frequently to find out whether it is being used somewhere else. I use a plagiarism checking service for this. These services use a vast amount of resources in plagiarism checking and can offer up to 10 papers check for free.